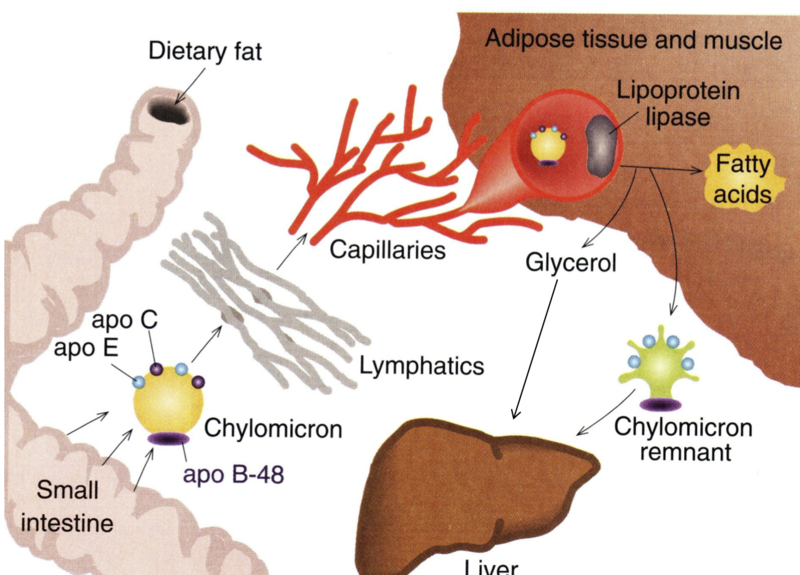 Can chylomicrons formed in the intestine, with apolipoprotein B48, transport lipids to adipose cells for storage? Fatty acids originating from chylomicron triacylglycerol are delivered mainly to adipose tissue, heart, and muscle (80%), while ~20% goes to the liver. - source: Harper's illustrated biochemistry. Lipoprotein lipase which is present in wall of blood capillaries anchored to endothelium by negatively charged proteoglycan chains of heparin sulfate requires phospholipids and apoC2 for its activity to take place. Hydrolysis takes place while the lipoproteins are attached to the enzyme on the endothelium. Triacylglycerol is hydrolyzed progressively through a diacylglycerol to a monoacylglycerol and finally to FFA plus glycerol with the help of lipoprotein lipase. Some of the released free fatty acid return to general circulation bound to albumin but the bulk is transferred to peripheral tissues like adipose tissue, muscles of heart etc. The lipase activity results in loss of 70%-90% of triacylglycerols and apoC2. (source: Harper's illustrated biochemistry) The remnant chylomicron is then taken up by liver by receptor mediated endocytosis. Here cholesteryl esters (present in concentrated form after loss of most of triacylglycerol) and remaining triacylglycerols are hydrolysed and metabolised. Not the answer you're looking for? Browse other questions tagged molecular-biology digestion lipids or ask your own question. Why do we have bacteria in our alimentary canal? Are all/most/any membranes comprised of lipids from the smooth ER? What happens to lipoprotein lipase after a sugar only diet? How are Mono and Diglycerides metabolized without the Free Fatty Acids of Triglycerides?